It’s Grand in the Silicon Beach Hub! 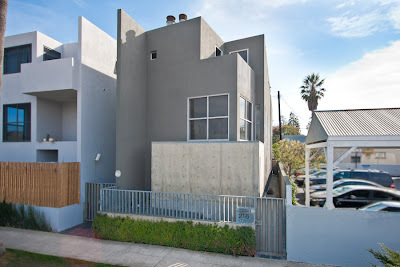 Stylish Home near Windward Circle in Venice! Style, privacy and modern sophistication was impeccably executed by the architects of this Grand home. Lomax-Rock created a dramatic and warm architectural zen home nestled in the Silicon Beach hub of Windward Circle. Soaring 16’ ceilings saturated with natural light, gleaming maple floors, and elegant architectural details. Gourmet kitchen features Caesar stone counter tops, Subzero fridge, Miele range, and abundant cabinet space. Refinished downstairs studio/office with mahogany floors and a separate entrance- perfect for a home office or entertainment room. Continue upstairs where you’ll find a mezzanine/loft area that overlooks the dramatic main room. Each floor has a spacious bedroom w/ ensuite bathroom; oversized master bedroom and bath with access to the expansive roofdeck that has 360 degree views from Venice, to Marina Del Rey, to Santa Monica- each in your backyard! Stylish Venice Beach living at it’s finest! Venice Garden & Home Tour this Saturday, May 4, 2013!